We specialise in secure commercial waste collection, recycling and destruction. From secure paper shredding to IT and hardware recycling, we offer complete peace of mind with the very highest levels of quality, integrity and service, helping with our customers compliance to the EU General Data Protection Regulation at all times. Secure collection and recycling of all electrical and electronic equipment, with all waste processed in the UK. Tailored services with high levels of security, professionalism and state-of-the-art equipment. Bespoke general waste, cardboard, paper, plastic and metal recycling for businesses of any size, with zero to landfill. Convenient, cost-effective and secure paper shredding services, with full collection to shred audit trail. At ESWM we have over 10 years of experience in all aspects of secure commercial waste collection, recycling and destruction. We tailor our confidential waste services to your individual needs – no matter how big or small they may be. And we always provide the same levels of exceptional security and professionalism, from collecting your confidential waste right through to recycling or destruction ensuring our clients comply with the EU General Data Protection Regulation (GDPR). We’re accredited to the British and European standards for the approved secure destruction of confidential materials. Our people are highly trained and vetted, our vehicles are satellite tracked and our commercial waste facility is patrolled, alarmed and monitored 24/7 by CCTV. From confidential paper shredding to destruction of computer hard drives, we’ll take care of all your commercial waste requirements, in line with current regulations and data protection laws, so you can be assured of complete security at all times. We’re a corporately responsible company, with strong environmental ethics, delivering the highest levels of commercial waste recycling in the UK. We’re proud to be at the forefront of developing solutions towards our commitment to a zero-landfill goal and a sustainable future. If you would like to request a call back please submit your name and number and we will get back to you as soon as possible. I have only used the service once when I was having a big clear out and needed a lot of shredding (I am the proverbial one man band working from a home office) but it was very efficient and cost effective and I got my needed certificate of destruction. When I need to dispose of more documents I will come back to you as being local it is very convenient to be able to arrange to pop in whilst I am out and about. We are very happy with your service! All your staff who we meet here are always friendly and polite. Thanks for providing a great service. I cannot fault the service we have received from Environmental Solutions. A quote was provided quickly, the member of staff who collected the paperwork was polite and helpful. Everything was taken away swiftly and the certificate was emailed straight through. Very happy with the service we received and would definitely use you again, and recommend to others. We find Environmental Solutions to be excellent. We create confidential waste; they come along and take it away. Which is what we want. We are really happy with the service provided by ESWM. We have always received a friendly and efficient service. 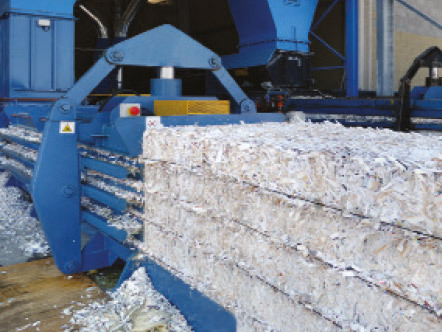 The team is quick to pick up our shredding and paper recycling when we have asked. I would highly recommend your company to anyone looking into confidential shredding and paper recycling services. We tailor our commercial waste collection services to your individual requirements – from weekly to fortnightly to monthly. While we will prioritise our customers who need waste collection services on a regular basis, we’ll always endeavour to fulfil any ad-hoc collections too. We also offer a ‘Diamond Service’, if a scheduled collection arrangement doesn’t work for your organisation. Please get in touch with us to find out more. Whatever commercial waste collection service you require, you can be assured we always provide the same high levels of service and security. We’re dedicated to ensuring the process is smooth and efficient, with the correct paperwork and equipment for the waste we’re collecting, and as little disruption to your business as possible.